Right after he healed the man born blind, Jesus told the people a parable about sheep. Jesus told people that someone who tried to enter a sheep pen without using the gate was a robber. Then Jesus said that he himself was the gate to the pen. The only way someone can enter the pen is through Him. Next Jesus said that only the shepherd would be willing to protect the sheep. A hired worker does not care for the sheep because he does not own them. Jesus said that he was the good shepherd, the only one willing to lay down his life for the sheep to protect them because he cares for them. The good shepherd knows his sheep, and the sheep know him. Jesus says he has other sheep in other places, and he will bring them all together to make one large flock with one good shepherd. Jesus’ words divided the people who were listening. Some people thought he was crazy, even demon possessed. Others protested that these were not the words of a demon possessed man because a demon cannot open the eyes of the blind like they just saw happen. 2. Before you begin story time, tell the children that today they will pretend to be sheep. You need all sheep to sit down inside the sheep pen. 3. Observe how the children enter the circle. Then announce to the children that there may be some among them who are not really sheep! 4. Have everyone stand up. If they entered the circle by the opening, then they are the really sheep, and they can sit back down. 5. If they are left standing, they then entered the circle by jumping over the ‘fence’ this means that they are robbers! You can pretend to chase away the robber and encourage them to enter through the opening so they too can be sheep and listen to the story. Jesus himself says in this passage that he is the good shepherd. He watches over the sheep, who are the believers. The sheep pen represents heaven. The only way to get into the pen is through the will of the shepherd. This means the only way to get into heaven is through Jesus. Like the good shepherd, Jesus is willing to lay down his life for the sheep because he cares for them. One day all believers will be brought together to be with Jesus in heaven and we will make one people from one kingdom. 2. Hold up the blanket between the two teams so that none of the children can see the other people from the other team. 3. Have each team pick one of their people to stand in front of the blanket. 4. When you drop the blanket, the two children who are now facing each other must say the name of the person who is in front of them. The first one to say the other’s name wins. 5. Repeat until all the children have had a turn. 1. This games plays like Simon says. One adult is the teacher and one is the stranger. Tell the children who is who. 2. The children are to obey the voice of the shepherd and ignore the voice of the stranger. Have the children turn around so they cannot see the adults. They must listen to their voices only. 4. If the children respond to the voice of the stranger, they are out of the game and must sit down. 1. Give each child a piece of colored paper. 2. Dispense small amounts of white and black paint into paint trays. 3. Dip only one finger into the white paint and press the finger onto the colored paper. Dot the finger onto the paper until you have a large oval full of finger prints. Refill the finger with paint as needed. 4. Taking a new finger, dip into the black paint. Create feet and a tail with the black paint. 5. 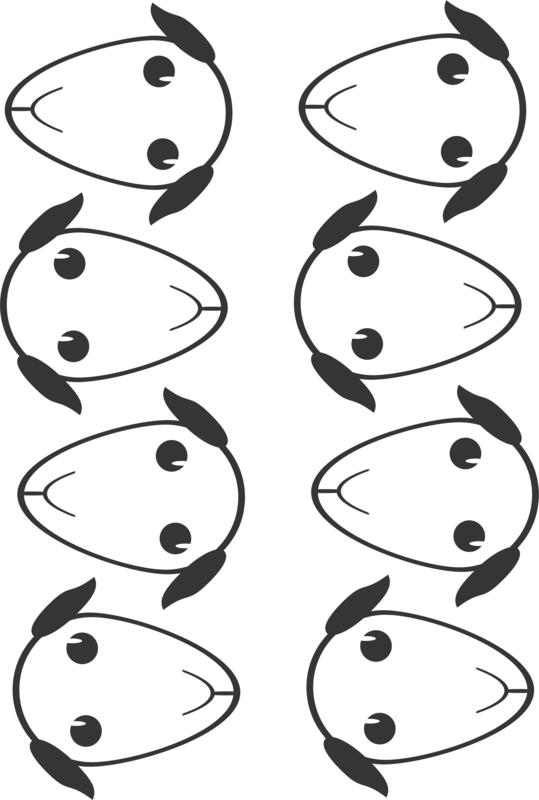 Color and cut out the sheep head template. Glue wiggly eyes to the head. Glue the head to the painted sheep body.